We'll see who cleans up Saturday. Just another day at Day Care. There's no crying in baby boxing! Baby Boxing - the predecessor to Midget Wrestling. Charlie and Emilio show off their winning ways.
" fly like a butterfly and stink like Huggies! " After enticing Curly to punch himself bare fisted in the eye, Moe has an epiphany for a future vaudeville routine. After an unsuccessful attempt at boxing early in his life, the young Babe Ruth turned his energies to another sport. Llllllllet's get ready to . . . WAAAAAAAAAH!!!! Shortly after the match, Merwin "The Pawtucket Pooper" McFlynn was disqualified when his mother tested positive for HGBM (Human Growth Breast Milk). Losing fighter Herman "Baby Fat" Feldman got over his disappointment quickly when Dolly Parton offered to "nurse him back to health." Get up, you big cry baby! "Run Home And Cry To Your Momma!" Mike Tyson and Evander Holyfield: The Early Years. 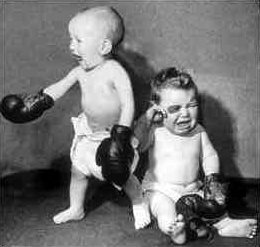 Producers rejected the early script for "The Fighter" on the grounds that audiences couldn't relate to a story about two toddlers pursuing the same dream. Nobody, and I mean NOBODY touches my sippy cup! !